This past weekend my son participated in a soccer tournament for the state championship. What this means is he played eight additional games for a total of 18 this spring. This also means I coached 18 games. I never thought I’d say I’m sick of the world’s most popular sport, but I am. The teams that succeed in reaching the state finals had three things going for them: skill, character, and endurance. The coaches and parents were just plain crazy for sticking it out. Similarly jobseekers who succeed in landing a job—the winner of a state final in soccer of the job search—demonstrate the same three traits throughout the entire process. Skills. Not enough to have the required skills and accomplishments, jobseekers must be able to display them in their written and verbal communications. I tell the participants who attend my Job Search 101 workshop that bringing their written and verbal communications together makes for a successful marketing campaign. The most obvious example of written communications would be the résumé, which above all else must address employers’ needs by demonstrating the required qualifications. Employers want to see the skills and accomplishments needed to do the job well, not a generic, one-fits-all document. The interview is the ultimate display of verbal communications. Let’s face it, if you can’t pass the interview, you don’t get hired. Only one person gets hired, and this is the person who shows he/she has the skills and accomplishments that fit the job. Know what skills the employer requires, so you can better predict the questions that will be asked. Character. This is a vague term but is essential to achieving likability, demanding respect, and showing humor. You must show your character when networking. Networkers appreciate other networkers who they understand—think clarity of skills and goals—as well as those who are willing to help them. Your character is essential at the interview, as it demonstrates your interpersonal skills, motivation, enthusiasm, ability to work as a member of a team, and other desired “soft skills” the employer is seeking. Your character also shows itself in your written communications. Many of us have received LinkedIn messages that are negative in verbiage and tone. The writers complain and make excuses about their past failures, showing a lack of self-awareness. This is another way for people to show a lack of character. Endurance. This is perhaps one of the most difficult of the three components to sustain. Sadly I must admit I was willing–nay hoping–for the soccer tournament to end, because I felt my energy drain from me with each game. Jobseekers sometimes feel this way, especially if the interview process stretches to five interviews over a period of 5 weeks. Some of my customer have described this hellish situation to me. This is when a jobseeker must reach down deep in his soul to move on, not dwelling on the worse–he doesn’t get the job. Maintaining endurance is a matter of treating yourself well during the process. Get enough sleep, spread your research out over a period of days and not cramming like a college student, and take a well advised break are some of the things you should do to keep the endurance. My response to jobseekers during these times is stay the course and do your best. Endurance is also required when writing tailored documents for each job, as opposed to blasting 20-30 resumes and cover letters over the Internet, or should we say into the black whole. Every resume and cover letter is unique to every job. Jobseekers must faithfully attend networking events or network in public whenever they get the opportunity. LinkedIn is a great way to network online, but it should not replace face-to-face networking. Demonstrating excellent skills and character is essential when speaking with others who may be able to help you, so consistency is important as you brand yourself. My son’s team was eliminated from the tournament in the semi-finals. You might think I was relieved, and up to the point where the final whistle blew, I thought I’d be happy for it to end; but I was actually disappointed that the games were over. The boys demonstrated skills, character, and endurance throughout the whole season. This is what I hope my customers are able to sustain. Of course the stakes are much higher–after all soccer is a game–but the same principles apply. This entry was posted in Career Search, Interviewing, Résumé Writing and tagged Character, Endurance, interviewing, resume, skills on July 6, 2013 by Things Career Related. I’m glad you mentioned character. Like you, I’ve seen a direct correlation between negativity and prolonged job search, and it’s especially prevalent on social media sites. 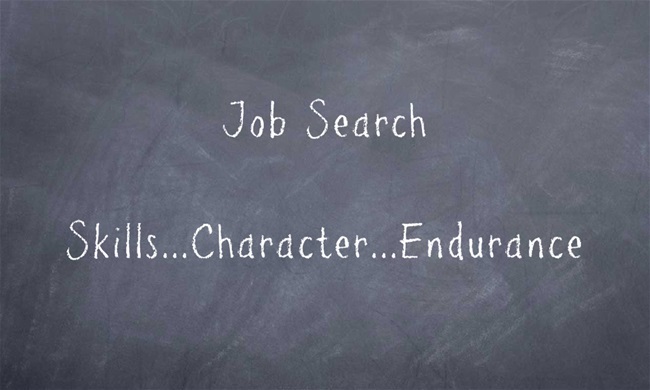 I know job search isn’t easy or simple for many people. For me, it never was, as I was a classic “job hopper” who frequently tired of office politics and wanted to be challenged in my work. Yet, when I went to interviews, I was intent (driven, to be exact) to be as positive as possible regarding what I could do, and why my energy would make a difference to each employer. I knew for a fact that I could work circles around others and that those who couldn’t see past my short tenures were missing out. This is a MUCH different tone than I hear from many job seekers. I can assure you that my success landing so many job offers (constantly surprising friends, family, and colleagues) wasn’t because I was the perfect candidate or that employers were always receptive. It was because I maintained my composure, no matter what I was asked (illegal questions, anyone?) nor what I found out about the company. (Ever had a weird interview, followed by the company’s collapse a few months later? I did.) I presented a professional attitude, even when I didn’t feel up to it, that spoke volumes to employers. Staying positive and upbeat, at least on the surface, WORKS. Staying the course when it seems employers want to say “No” too often also works, as does refraining from cultivating a negative attitude. We don’t have to let others know what we really think… seriously. Putting a not-so-great thought into any online forum just lets it live on, well past a job search, and it can have consequences for years to come. Congrats on hanging in there for your son when I’m sure there were times you wanted to be elsewhere. I’m sure it made a lasting impression. It was a struggle getting through those 8 additional games, but I think about the jobseekers who have the endurance coupled with character who last through five or more interviews only to find out they were not the one selected. It’s hard to say, “Hang in there. The tide will break” and sound sincere. I’m battling–or maybe I’ll give him the final word–with a jobseeker who claims networking has a 99% FAILURE rate. How can you argue with someone who has totally thrown in the total? Rather how can you persuade someone of the virtues of networking when that person is totally convinced that it doesn’t work? I say keep a positive attitude when networking, and if you land a job by other means, call the pundits wrong. Just as long as you get a job is what I care about. Bob, this was such good info, and a great reminder for me. Thanks again. And, congrats to your son and his team. Thank you, Marilyn. I’m glad it hit home, and my son is glad soccer is over for the year.